Home » Press » TOUR, SCREENING, AND ARTIST TALK MARK CLOSING OF JANM’S "TRANSPACIFIC BORDERLANDS"
The Japanese American National Museum (JANM) will offer a trio of exhibition-related public programs for the closing weekend of Transpacific Borderlands: The Art of Japanese Diaspora in Lima, Los Angeles, Mexico City, and São Paulo, on February 24 and 25. They include a curator-led exhibition tour, a film screening and live musical performance, and an artist talk about cultural representation. On Saturday, February 24, at 10:30 a.m., Kris Kuramitsu will lead a gallery tour of the Los Angeles portion of the exhibition, for which she served as curator. Featured artists include Ichiro Irie, Shizu Saldamando, Kenzi Shiokava, and Shinpei Takeda. The tour is limited to 25 participants. The cost is $12 for the general public and free for JANM members. Tickets are available now and include museum admission. Also on February 24, at 2 p.m., JANM will screen Our Man in Tokyo (The Ballad of Shin Miyata), a production of the museum’s Frank H. Watase Media Arts Center. The documentary explores the struggles and obsessions of Shin Miyata, a Tokyo-based record label owner, music promoter, and cultural ambassador who has been distributing Chicano music and bringing East Los Angeles bands to Japan for nearly 20 years. The film explores Miyata’s personal connection to East LA, the joys and difficulties of introducing authentic and diverse representations of Chicano culture to Japan, and the conscious efforts Miyata has made to break stereotypes on both sides of the Pacific. Directed by Akira Boch, Our Man in Tokyo will be followed by a discussion with Boch; Miyata, who is flying in from Tokyo for the event; and the members of El Haru Kuroi, an East LA musical trio whose unique compositions draw from their upbringing in the city as well as elements of Mexican, South American, African, and American jazz music. El Haru Kuroi will also perform a live set. This event is included with museum admission; RSVPs are recommended. On Sunday, February 25, the final day to view Transpacific Borderlands, the museum will present a panel discussion on social representation and cultural context across borders. Selene Preciado, a program assistant at The Getty Foundation and independent curator, will moderate. Panelists will include JANM’s Vice President of Exhibitions Clement Hanami, who served as overall curator of Transpacific Borderlands, and featured artist Shinpei Takeda. This event is included with museum admission; RSVPs are recommended. Transpacific Borderlands: The Art of Japanese Diaspora in Lima, Los Angeles, Mexico City, and São Paulo examines the experiences of artists of Japanese ancestry born, raised, or living in either Latin America or predominantly Latin American neighborhoods of Southern California. The exhibition shows how ethnic communities, racial mixing, and the concepts of homeland and cosmopolitanism inform the creativity and aesthetics of this hybrid culture. 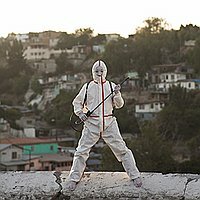 Transpacific Borderlands is part of Pacific Standard Time: LA/LA, a Getty-led initiative exploring Latin American and Latino art in dialogue with Los Angeles, and is made possible through grants from the Getty Foundation. The presenting sponsor of PST: LA/LA is Bank of America. For more information about the exhibition and to purchase tickets and/or RSVP for closing weekend events, visit janm.org/transpacific-borderlands. Transpacific Borderlands: The Art of Japanese Diaspora in Lima, Los Angeles, Mexico City, and São Paulo examines the experiences of artists of Japanese ancestry born, raised, or living in either Latin America or predominantly Latin American neighborhoods of Southern California. By looking at the work of Japanese Latin American artists, the exhibition shows how ethnic communities, racial mixing, and the concepts of homeland and cosmopolitanism inform the creativity and aesthetics of this hybrid culture. Transpacific Borderlands is part of Pacific Standard Time: LA/LA, a Getty-led initiative exploring Latin American and Latino art in dialogue with Los Angeles, and is made possible through grants from the Getty Foundation. The presenting sponsor of PST: LA/LA is Bank of America. Following its successful removal from the auction block by dedicated Japanese American community leaders and activists, the Allen Hendershott Eaton Collection of art and craft objects created by Japanese Americans during their World War II incarceration in American concentration camps was transferred to the Japanese American National Museum in 2015. It was conserved with help from the National Park Service’s Japanese American Confinement Sites grant program and will now be on view at JANM prior to traveling to several other venues in the United States. Through this display tour, the museum hopes to collect more information on each artifact so that it can continue to preserve and catalog this important collection. Contested Histories is on view in the Hirasaki National Resource Center. Please check the HNRC web page for its hours.